The commissioners’ resolutions were in response to a lawsuit filed May 23, 2018 - Ohio A. Philip Randolph Institute v. Kasich, filed by plaintiffs Ohio A. Philip Randolph Institute, the League of Women Voters of Ohio, and individuals from every congressional district in Ohio. Co-counsel include: ACLU National, the ACLU of Ohio, and the law firm Covington and Burling. The briefing, held at the Lake County Administration Building, was attended by Ashtabula County Commissioner Casey Kozlowski, Geauga County Commissioners Timothy C. Lennon and James W. Dvorak, Lake County Commissioners Jerry Cirino, Ron Young and John Hamercheck, and Lake County Prosecutor Charles Coulson. Cirino took the lead, stating they were there to explain what he called the “unprecedented action” of filing the briefs, which they felt was best for the counties. “What we are filing is a motion in federal court, asking leave to file an amicus brief,” Coulson said. “We have to get permission to do it. Coulson stressed they were not seeking to become party to the lawsuit. Cirino explained the lawsuit claims the current congressional district map, created by Republican legislators in 2011, was gerrymandered and therefore unconstitutional, and asks that it be changed prior to the 2020 election. He stated their main interest in wanting to file the amicus brief was to affirm, in court, that the current Congressional District 14, which includes all of Geauga, Ashtabula and Lake counties, was not unconstitutional and therefore should not be changed as proposed in the plaintiffs’ map. “We also are taking these actions because it is important to defend what the voters approved last May when they resoundingly voted in favor of the adoption of Issue 1,” Cirino said. Issue 1 was a bipartisan measure which would have state legislators of both parties work on preparing a new congressional district map, using the new 2020 census figures, which would not just benefit the party in control. Cirino stated the League of Women voters had initially supported passage of Issue 1. Lennon noted Geauga County, on the plaintiff’s map, would be split between two different congressional districts, making it a minority piece in each district. Young asked if it wouldn’t be confusing if the court changed the districts before the 2020 election, and they would still need to be redrawn after the 2020 census. DeLeone agreed it would be and some districts could end up with three different representatives in a four-year period. Cirino noted the majority of Lake County had voted for President George W. Bush for two terms and then President Barack Obama for two terms. He said the voters’ decision should be respected, adding it will be a difficult process. Hamercheck stated the three counties have historically shared values and experiences and should be kept in the same district. He said people all over the country were questioning the electoral process, but he wondered about the timing of the lawsuit, asking why the redistricting was not called into question years ago. The commissioners stressed they believed the three counties should not be separated at this time and they should wait for Issue 1 to take effect. Kozlowski stated the map approved in 2011 had bipartisan support. Part of the lawsuit states, “In statewide and national elections, Ohio typically swings from Democrats to Republicans. In this decade, Republicans have secured 51 percent to 59 percent of the total statewide vote in congressional elections. For example, in 2012, the Republicans received 51 percent of the congressional vote. Yet the challenged map has consistently given Republicans 75 percent of the congressional seats. 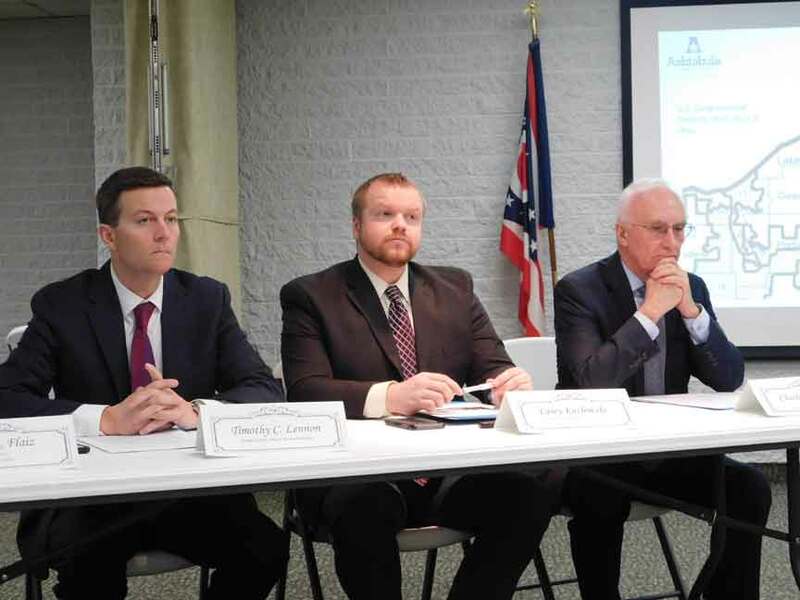 Geauga County Commissioner Timothy C. Lennon, Ashtabula County Commissioner Casey Kozlowski and Lake County Prosecutor Charles Coulson participate in the Jan. 29th press conference regarding the tri-county boards of commissioners filing an amicus brief.